12 Ways To Increase The Value Of Your Web Site Content! You need to have a way with words in order to increase the traffic to your web site. However, sometimes, the most intelligent people in the world can have difficulty effectively communicating their ideas in writing to others. When (otherwise) intelligent business people develop a web site complete with great benefits it can fail simply because of their use of words. Learning to communicate to get your point across clearly and succinctly without rambling is an important skill to learn when marketing on the Internet. This can take some time to learn. However, it's not impossible. It just takes practice. Of course, if you don't have the time to learn these crucial communication skills then you can always hire a professional to help you. Sometimes the best solutions are sitting right in front of you. When writing to produce more web site traffic you need to make your web site easy for others to read. It is ALWAYS better to write in laymen terms than to use long scientific terms or technical mumbo jumbo. You want people to be able to read the pages on your web site without getting a headache or needing to refer to a dictionary. Visitors should not have to learn how to "translate" your web site in order to understand what you're trying to say. Visitors will always exit quickly from any hard to read/ understand web site. A. Whenever we Human Beings encounter new information our brain asks itself, "What is it"? If the brain cannot place this new information within a meaningful context the person becomes confused and LEAVES. B. Nobody likes to appear stupid (even to themselves). When information is inaccessible (and people get to feel stupid because they don't understand) they LEAVE. In short, DON'T talk down to people and DON'T treat people other than as intelligent Human Beings. The fact that you know a lot about something should never exclude other people. The definition of good communication is the ability to share your knowledge and ideas with others, so they "get" it. Of course if your market is technical then using technical terms is appropriate. In this context this would be "good" communication. Good communication is always about an appropriate context. 1. Relevance: Be sure all your content is relevant to your web site. Only provide information that readers are looking for and which is relevant to your web site theme and its products. 2. Point Of View: When you begin writing your first paragraph try starting the paragraph with your conclusion about the topic. State your point of view right up front, This will grab your readers' attention and keep them reading the article, because you told them "what you're going to tell them"... and then you "told" them. 3. Short Sentences: Keep your paragraphs and sentences short and to the point. Readers find it difficult to read long, wordy web pages. Again, this is a brain "thing" (especially on a computer screen). 4. Active Voice: Do not write in a passive voice. Readers respond better to action words and a strong voice which tells them what you want them to do. 5. Word "Flow": Pay attention to how your words flow. Always read your article out aloud to yourself before you publish it. Listen to its flow. Reading your articles out aloud will help you with your own "flow". Doing this will also help you to identify and refine your own writer's "voice" (Yes, we all have one). It will also help you to identify "typos" which just scream "amateur" to your reader. 6. Proofread: Always proofread all writing/ articles before posting these to your web site, forum, articles directory or blog etc. Apart from article readability this is about being a professional. If you can click a mouse button you can run a spell check. It takes 3 minutes. 7. White Space: Make liberal use of white space within your articles. What this means is to "open up" your article, so it's easier on your readers' eyes. This again is a brain "thing". When the Human brain can't access information easily, the person leaves. 8. Computer Friendly Fonts: Use computer screen friendly fonts like Arial, Verdana, Courier and Tahoma. Times New Roman is not an eye friendly font on a computer screen/ monitor. 9. Foreign Languages: Understand that your web site is accessible to viewers from all over the world. However, visitors from other countries (who speak languages other than English) may not easily understand your language or your web site content. If your market is global then think globally. Translate some of your content into the languages of the people you wish to reach. Yes, the language of the Internet is English, however this is also about respect for others, their language and their culture. You will be surprised how doing this on a few of your core web site pages generates sales. 10. Regional Focus: If your web site is not for worldwide viewing then list the regions which your web site best serves. Add these region/s to the page description and keywords. This way, if someone in Australia is looking for a veterinarian he or she won't end up frustrated after looking through all the veterinarian web sites that only cater to pet owners in Paris, France. Regionally focused topics have value to worldwide viewers. Perhaps a person in Italy intends to visit your city and needs to speak with a veterinarian about traveling with their pet. You may wish to provide general information on your web site that will appeal to visitors outside your specified region. 11. Slang: Most of the web sites on the Internet are in English, However, NEVER use English slang on your web site. Slang is not an internationally understood language, and it is difficult to translate from one language to another. Of course if your web site is about English slang then that's a different matter. 12. Conversions: Take into consideration currency and number conversions. If you are listing a price for services on your web site be sure to list the currency you accept (USD, pounds, yen, etc.) The same applies if you are listing measurements or sizes. Always list the conversions or provide a link to a web site which specializes in these conversions. When in doubt hire a professional translator. Your goal here is to increase the traffic to your web site. By using the World Wide Web you can potentially reach an audience of millions of people. It's one thing to have the technical capability to reach these people. It's a completely different thing to be able to communicate effectively with them. Be concise and to the point. Learn to "walk in another person's shoes" for awhile, follow good practice (as stated above) and you'll be completely surprised at the results you get from the web, promise. Live Well. Expect Success! "If you haven't worked this out, you soon will.There's a lot of NONsense zapping around in cyber-space about Internet marketing. Find out what works, what doesn't... and what's worth your money." Subscribe To The e*Analyst Qzine! 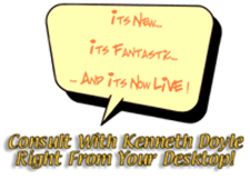 Read More Articles By Kenneth Doyle!